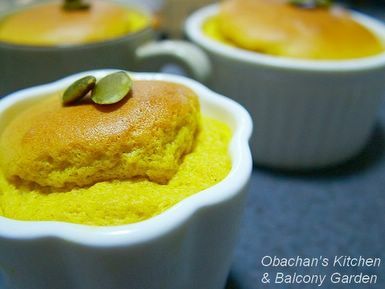 These are kabocha pumpkin souffles I made yesterday. I know. It’s not Halloween yet. 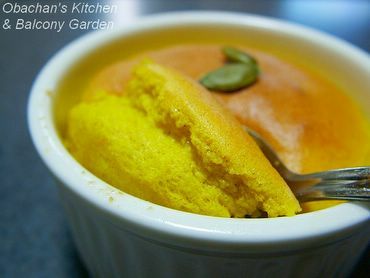 But I just felt like making a dessert with the kabocha pumpkin which I had bought the day before. I used a Japanese recipe, because I thought it was safe to stick with the recipe that called for this particular type of pumpkin. But this was not a great success. The souffles did not rise as much as I wanted them to, and did not turn out as moist as I expected. Also, they tasted rather bland to me, so I made sherry sauce with sherry, sugar and butter. I liked the sauce very much, but I have to admit that it almost hid the mild, natural flavor of the pumpkin. Oh well... Better luck next time. I'll be making my dad a dairy-free pumpkin pie for Canadian Thanksgiving this weekend, he's been requesting it for years! I think they look just great, and I like the contrast between the yellow of the soufflé and the white of the mould. What kind of pumpkin is the kabocha? is that all the sheryy sauce was made o. just sugary and sherry? and you reduced it on the stove? Obachan, but the picture is too yummy and I'm drooling. But Obachan, they look great! I love the second picture, that's a beauty! hello=) This is my first time on your site and i must say that it is wonderful. I was wondering tho why you do not post recipes for your foods? I would love to try them out on me own. To be honest, I didn’t know there’s such a thing as Canadian Thanksgiving until I read your comment. Sounds like pumpkin pie is a popular thanksgiving dessert over there, too? Kabocha is something like this. It’s rather dry and tastes kinda nutty, and I love it when simmered like this. Thank you. Yeah, the second one is my favorite, too. Thanks for your nice comment. There are several reasons why I don’t post recipes for some of my entries. If it’s a Japanese everyday-meal type dish, I depend on eye measure only because that is the way I was taught by my mom. And tasting a little bit of whatever I’m making, I decide to add more seasonings or to thin it down. So it’s absolutely too painful for me to look for a measuring cup or spoons every time I do that and take notes unless there’s a damn good reason to do so. If the entry is something I made following a Japanese recipe on the net or a Japanese cookbook, I avoid translating the recipe into English and posting it on my blog without a permission from the original recipe owner. Posting a translation is not the same as posting the original recipe as-is and giving it a proper credit, because mistranslation can really ruin the recipe the way the recipe owner had never intended. And when the recipe owner cannot understand English very well, (s)he cannot check if the translation is correct or not and usually doesn’t want to have his/her name attached to something like that. To me that is perfectly understandable. Thank you. It’s a real warm, healing color, isn’t it?